Reminiscent of the images of ancient Native Americans, this original etching reverently created by Gary Schrodt invites a celebration with nature. Features: Top slides up for easy filling and cleaning Multiple perches allow for plenty of bird. 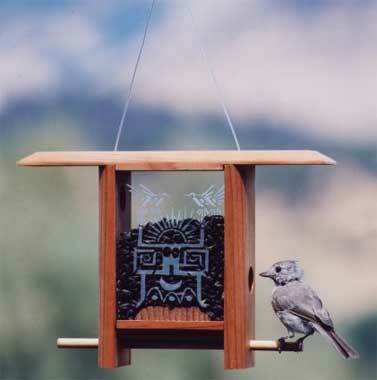 Two etched glass panels Unique design keeps seed inside and safe from elements Removable lower perch for easy cleaning. These birdfeeders have two feeding ports.